Unbelievably cute and totally dazzling Nutkin the squirrel has been captured in his favourite pose - eating. Indeed he has been created in shimmering Austrian crystal stealing a grape from an impressive, hanging vine of champagne crystal grapes. 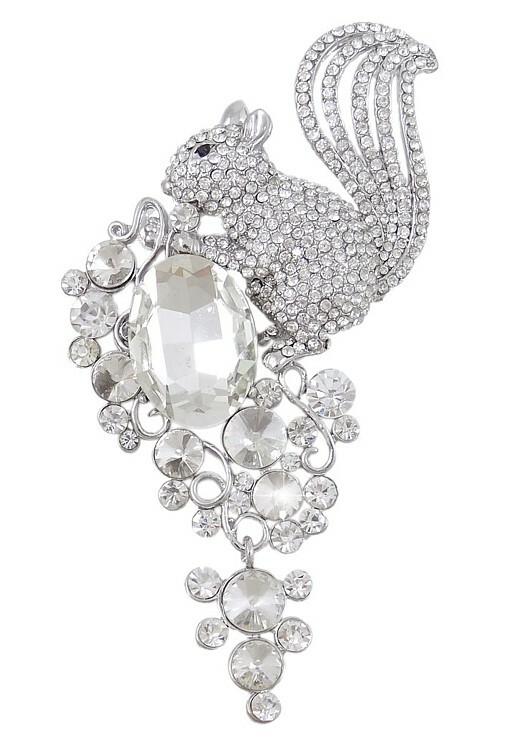 Big, bold and very beautiful, this delightful brooch looks divine on a coat or jacket lapel, or pinned on an LBD to give it a spectacular dash of pizzazz. Eyes will pop, jaws will drop and compliments will fly when you give it a try! Size: 11.5cm (4½") x 6cm (2½") Silver Rhodium setting.